Woohoo! 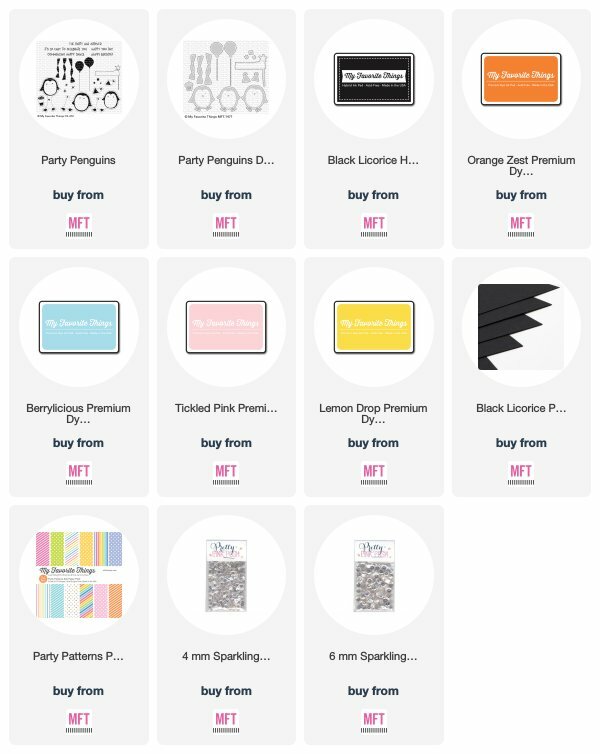 Day 1 of the February Release Countdown, so not long now before you can jump on the website and order all these goodies..
Today, I chose to create a card using the Party Penguins.. I took Black Licorice ink and inked up the body of the penguin, then I die cut out and with the feet and nose I applied Orange Zest ink to the stamp and aligned up the feet as best as I could and stamped those onto the penguin.. Setting these aside, I took a trimmed piece of white card stock and applied Berrylicious to the top part of the card..
Once I was happy with the blending, I stamped confetti using Tickled Pink, Berrylicious and Lemon Drop ink.. Adding my penguins and then trimming a piece of pattern paper from the Party Patterns, adding this below the penguins.. I completed the card by stamping and embossing a sentiment to Black Licorice card stock, adding this to the pattern paper and a scattering of Clear Sequins.. There is load more inspiration from the Team so be sure to swing on by to check that out..
Have a fabulous crafty day!